First of all, this ginger beer doesn’t have beer in it. My homemade ginger juice and soda version is non-alcoholic… unless you add liquor, of course. Second, have I mentioned lately how much I appreciate you all? Thank you for visiting. Thank you for investing your time and energy (and money) into making my recipes. Your comments and emails brighten my days and make this crazy food blogging thing worthwhile. I’m not sure when this dark cloud over my head will clear, but I know that I have to make the most of this one wild and precious life. I’m working on it. Let’s lighten the mood with ginger. I’ve been totally obsessed with ginger lately. On its own, ginger is fiercely spicy and fragrant. Used in Chinese and Ayurvedic medicine since forever, it’s a powerful anti-inflammatory that boosts circulation and cleanses the body. It can calm nausea and soothe upset stomachs (source: The New Whole Foods Encyclopedia). There’s really not much it can’t do. Just a hint of fresh ginger lends peppery spice and complexity to savory dishes, and powdered or fresh ginger brightens up baked goods. Ginger has been a predominant flavor in my recipes lately, making its way into ice cream, banana bread, two soups, granola, couscous and pancakes. Ginger beer features the flavor most prominently, which I love. One sip warms me up from the inside. Ginger beer has traditionally been brewed with a live culture, which creates carbonation as it ferments. These days, most ginger beers available in stores are non-alcoholic. Ginger beer is like ginger ale, but with a lot more kick. It tends to be more cloudy and less sweet than ginger ale, and the ginger flavor is unapologetically in your face. Most recipes for ginger beer and ginger ale have you cook the ginger in sugar water to mellow the flavor, but this recipe uses raw, pungent ginger. Beware: my ginger beer concentrate is for serious ginger lovers only. To make this ginger beer, you’ll just need a blender or food processor and a good fine mesh strainer. My rusted hand-me-down strainer let too much ginger pulp through, so an upgrade is in order. You’ll also need a big spoon, lots of raw ginger, lime and club soda (because you won’t want to drink the undiluted concentrate). 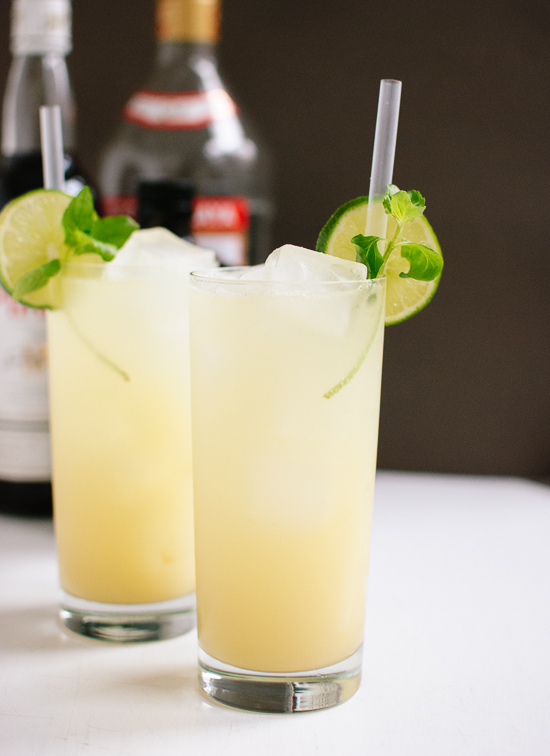 Ginger beer is delicious on its own, but it also happens to make the best cocktails EVER. 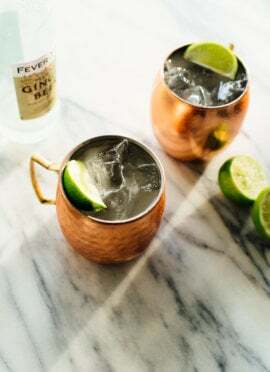 Mix ginger beer with a healthy splash of any basic liquor, squeeze in some lime, and you have your self a simple and refreshing highball. You could just buy ginger beer at the store, but most (like Reed’s) are too sweet for my taste. Mix this fiery ginger beer concentrate with club soda to make homemade ginger beer. Adjust the amounts of sweetener, club soda and lime to suit your tastes. Preserve leftover concentrate by freezing it in ice cube trays. 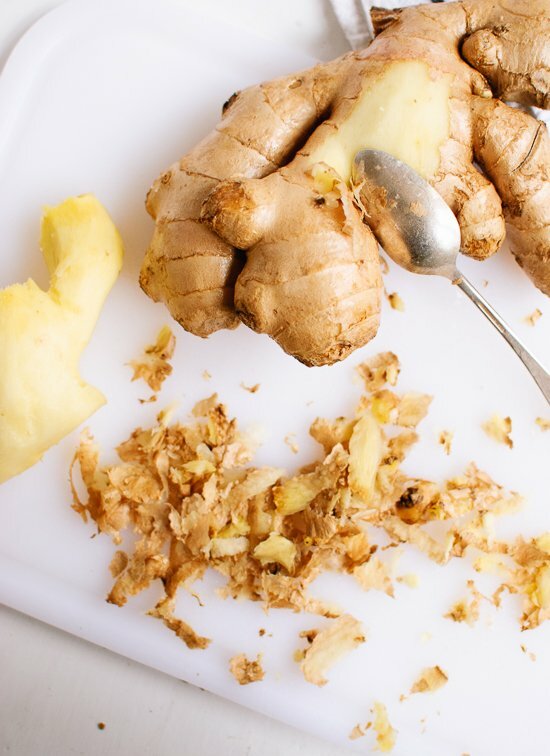 In a blender or food processor, liquefy the ginger and 1 cup of water for 3 minutes. Strain the juice into a large bowl or pitcher. 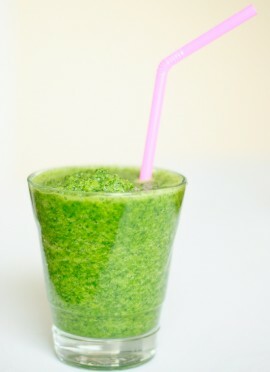 Transfer the ginger pulp back to to the blender or food processor, add another ½ cup of water, and liquefy again. Strain again, adding the liquid to the first batch. Again transfer the pulp along with another ½ cup water, liquefy again, and add to the liquid. Press on the solids with the back of a big spoon to squeeze out as much of the juice as you can. 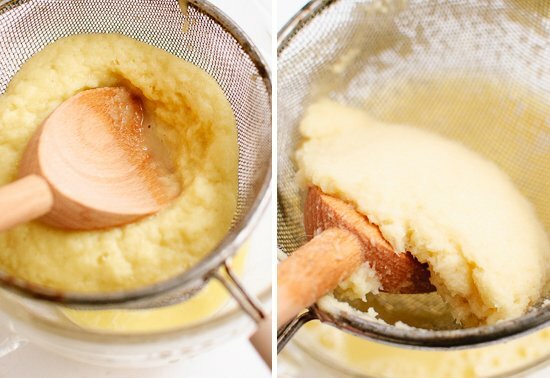 Discard the mashed solids and rinse out your blender/food processor. Pour the liquid into the blender/food processor. 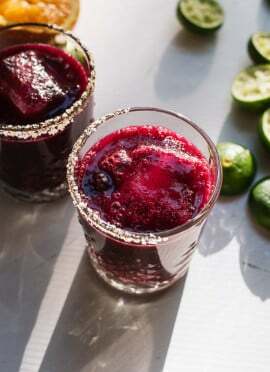 Pour in the lime juice and 1 ¼ cups sweetener. Blend for 30 seconds. 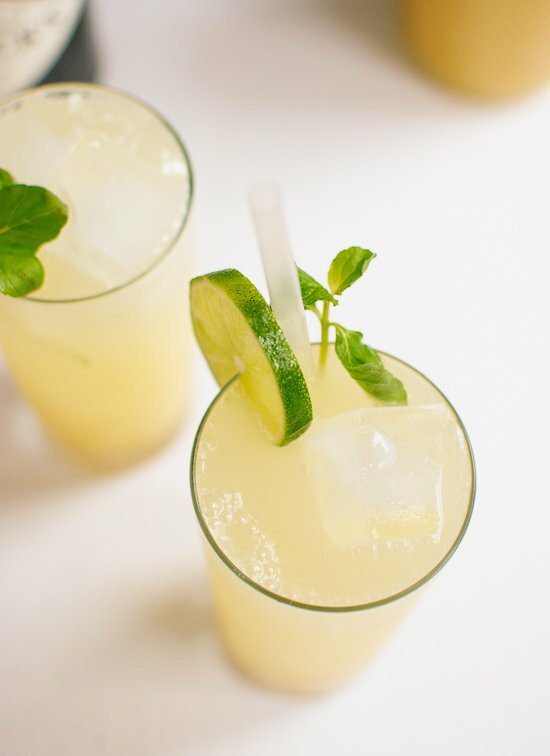 To taste for sweetness, pour about 2 ounces ginger concentrate into a glass along with about 8 ounces of club soda. If it’s not sweet enough, blend in more sweetener until it reaches your preferred sweetness. Refrigerate up to 3 weeks. Shake before serving. 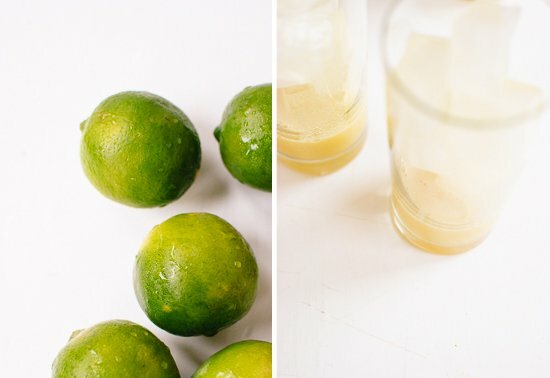 Add a squeeze of fresh lime to your ginger beer before serving. Fresh mint and/or candied ginger make nice garnishes as well. Adapted from Lottie and Doof, originally from Jam It, Pickle It, Cure It by Karen Solomon. Yields about 36 ounces ginger beer concentrate. If you are using 2 ounces ginger beer concentrate per ginger beer, that means you can make 18 ginger beers. Feel free to double the recipe if you’re throwing a party. I’ve tried this recipe with agave nectar and honey. I prefer the neutral taste of agave nectar. Pure cane sugar is traditionally used in Jamaican ginger beer recipes and may produce the best flavor of all. If you want a ginger ale syrup recipe, check out Joy the Baker’s recipe. If you’re not sure what to do with all that ginger beer concentrate, freeze it in ice cube trays! 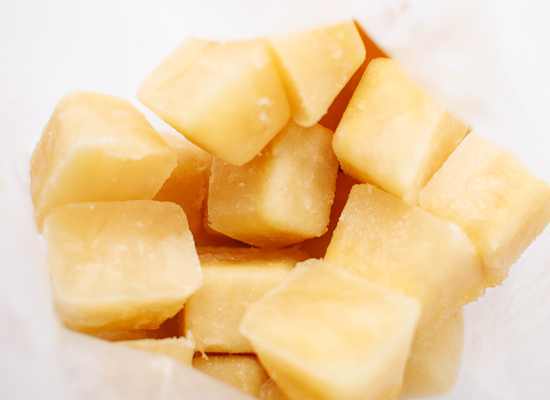 The cubes will last for several months in the freezer (store them in an airtight freezer bag). See photo below. P.s. If you’re looking for a simple savory dish to put together this week, I highly recommend this Greek quinoa with avocado, arugula and cherry tomatoes. Find my version of BHG’s recipe at the Delish Dish blog. Hi to all! I cannot believe that I have not yet rated this Ginger Beer recipe the 5 stars that it so greatly deserves. I have been making this for 6 months now? In between batches, I have tried other recipes but for both ease and great taste, this one wins for me. I have made this with both limes & lemons, & personally, I prefer lemons but that is just personal preference. I have also made this with table turbinado sugar, stevia, & coconut sugar (don’t ever do that!). Turbinado makes a fine ginger beer whether using lemons or limes. Thanks Cookie & Kate! Thank you so much for reviewing, Judy! I’m so glad this has been such a winner for you. Thanks for the recipe! will be making this today. Just to clarify, you actually use 1 1/4 lbs of ginger? That is sooo much. Yes! It’s a concentrate, so it requires lots of ginger. Fantastic! Thank you so much for this recipe!! I am just off to get the ginger and it’s being constructed this very day. We buy a brand in UK called Belvoir Ginger Cordial. It is absolutely superb and not too expensive, however; there is nothing better than home made. I’ve tinkered with some liqueur recipes in the past which require capsicum tincture – Could I obtain that anywhere in UK? Sadly not. My game plan then is to incorporate a couple of bad boy hot capsicums into your delicious recipe and see what happens. I’ll post the results – if my face is still intact. I made this recipe and it needs a lot more sweetener to come close to anything similar to what I’ve bought from a store. Plan to use at least 2 cups of sugar. The other issue I found is a significant amount of pulp particles remained in the strained liquid. Plan to leave your blender pitcher in the fridge for a while for the solids to settle at the top and bottom so you can remove them. Thanks for sharing your experience, Stewart. Made this 3 or 4 times, it is the best. I use 1 ice cube to a glass of hot water, then add a small cut of lime and drink. It always makes my throat and tummy feel better. Also good to just drink. My boys are crazy about ginger beer and have tried all the non-alcoholic specialty brands. I tried a couple of yeast-based recipes at home that ended up going down the drain. Then this! Your recipe is fantastic. The flavor, the burn, the after-taste–all as good or better than the store-bought. I made it with regular white cane sugar and a bit of brown sugar as well as Italian volcanic lemon juice. My next batch will be with agave or honey to compare. My boys say this is a winner! I’m glad you loved it, Russel! Thanks for your review. I just made this and it is fantastic. I have been buying syrup for like $16 a bottle and I finally decided to give it a try. Sure enough it wasn’t that hard and it tastes way spicier. This looks delicious and I can’t wait to try it. What is the purpose of multiple strainings? Is there a reason why you couldn’t add all the water at once & purée it a bit longer & then strain it through a nut milk bag? Hi Cici, good question. You’re really just trying to extract as much of the ginger flavor as possible, which worked better for me with multiple strainings. Granted, I was using a hand-me-down food processor back then, so if you have a really great blender, you might be successful with your idea. Please let me know if you try! Kidding you were not when you said this is for serious ginger lovers only. Its fantastic! I originally tried to strain with a french press coffee maker, but that didn’t work too well – can’t get enough push to extract the liquid – and now my french press will probably taste like ginger for evermore. Oh well. I ended up using a colander, then a stainless steel pour-over coffee filter, which worked fine. The ginger pulp ended up in the compost bin, but it seemed like there should be something else that could be done with it – it’s still chock full of gingery goodness. I don’t like things too sweet, so I started with a cup of agave nectar. In the end, the right amount seemed to be 1-1/4 cups. I have a DIY sodastream setup with a CO2 tank to make the final carbonated product. This ginger beer, with lime and Belvedere vodka, is heaven-on-earth. This will be my go-to summer cocktail. Thanks for a great recipe! I’m glad you are one of them, Martin! You’re welcome. Sounds like a refreshing drink. I make this recipe all the time it is so good, and easy to make. This time ,I used demerara sugar gave it a nice color and taste. Excited to try this! If I want to use sugar do I need to make a syrup, …or just stir in 1 1/4 c of sugar? Hi Tyra! Just add the sugar in place of the agave nectar and that should work well. I’ve bought all ginger beer brands, I drink it every night but recently I decided to do homemade and see if I could save some $, as there are only 2 brands that are stronger which are Belvoir and Fever Tree, but they re also the priciest. I have tried fermenting with yeast and also only the syrup mixed with carbonated water, but in all recipes I did like you mentioned about ‘most recipies’ – cooking the ginger in water with sugar. I use a lot of ginger but for some reason I feel when I mix the water, it feels too watery.. so then I do 1/3 syrup and 2/3 water but then it’s not as carbonated and tastes more like a cold ginger tea.. Have you tried both ways (cold and cooked)? I always thought cooked would make it stronger (I’m obsessed with ginger).. but now I’m wondering if your recipe would actually be stronger than cooked? I’ll be giving a try on yours for my next batch! Thank you for sharing! That’s a lot of ginger beer, Felipe. Let me know what you think when you try it! Omg your recipe is so much stronger! I just made it today and to my surprise, doing your way makes it much stronger than the way I would always do (cooking and simmering for a few hours), not only it tastes much fresher, it’s also much easier than the cooking way! I’m glad I found your recipe, thanks! WOW! This make a GREAT ginger beer. My daughter gave me her soda stream so I googled ginger beer recipes and I am so glad I found yours. It’s so easy to make and tastes so fresh. I sent my husband out for some vodka to make Moscow mules tonight. This will be my go to recipe. Five stars for you. Thank you. I’m glad you loved it! Thanks for the review, Linda!